Petermann Glacier connects the Greenland ice sheet to the Arctic Ocean. The vast flat expanse stretching into the background is Petermann Glacier, well over one-third of which has now broken off. Photo by David Riedel, British Columbia. 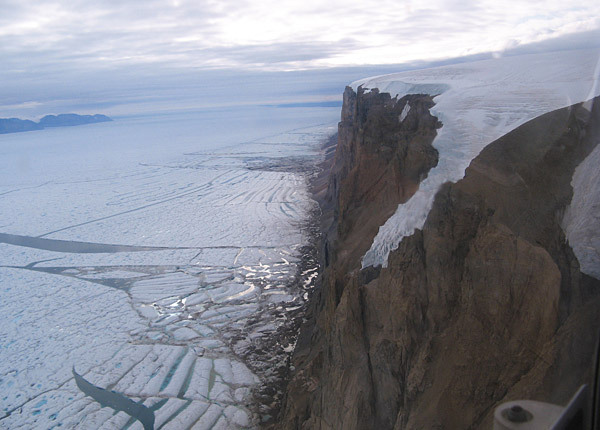 7:51 p.m., July 16, 2012--An ice island twice the size of Manhattan has broken off from Greenland’s Petermann Glacier, according to researchers at the University of Delaware and the Canadian Ice Service. The Petermann Glacier is one of the two largest glaciers left in Greenland connecting the great Greenland ice sheet with the ocean via a floating ice shelf. 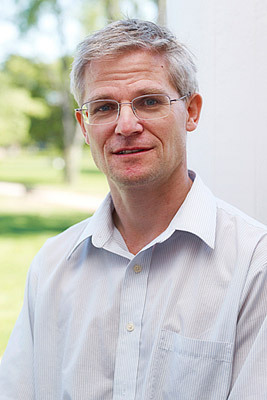 Andreas Muenchow, associate professor of physical ocean science and engineering in UD’s College of Earth, Ocean, and Environment, reports the calving on July 16, 2012, in his “Icy Seas” blog. Muenchow credits Trudy Wohleben of the Canadian Ice Service for first noticing the fracture. UD's Millicent Sullivan and Kristi Kiick have received a $1.4 million grant from the National Institutes of Health for research that could provide a new approach to the treatment of chronic wounds. The American Chemical Society is highlighting the legacy of the late Nobel laureate Richard Heck, the Willis F. Harrington Professor Emeritus of Chemistry at the University of Delaware with a digital tribute on its publications website. The discovery was confirmed by reprocessing data taken by MODIS, the Moderate Resolution Imaging Spectroradiometer aboard NASA’s Terra and Aqua satellites. At 46 square miles (120 square km), this latest ice island is about half the size of the mega-calving that occurred from the same glacier two years ago. The 2010 chunk, also reported by Muenchow, was four times the size of Manhattan. “While the size is not as spectacular as it was in 2010, the fact that it follows so closely to the 2010 event brings the glacier’s terminus to a location where it has not been for at least 150 years,” Muenchow says. “The Greenland ice sheet as a whole is shrinking, melting and reducing in size as the result of globally changing air and ocean temperatures and associated changes in circulation patterns in both the ocean and atmosphere,” he notes. Muenchow points out that the air around northern Greenland and Ellesmere Island has warmed by about 0.11 +/- 0.025 degrees Celsius per year since 1987. The ocean and sea ice observing array that Muenchow and his research team installed in 2003 with U.S. National Science Foundation support in Nares Strait, the deep channel between Greenland and Canada, has recorded data from 2003 to 2009. 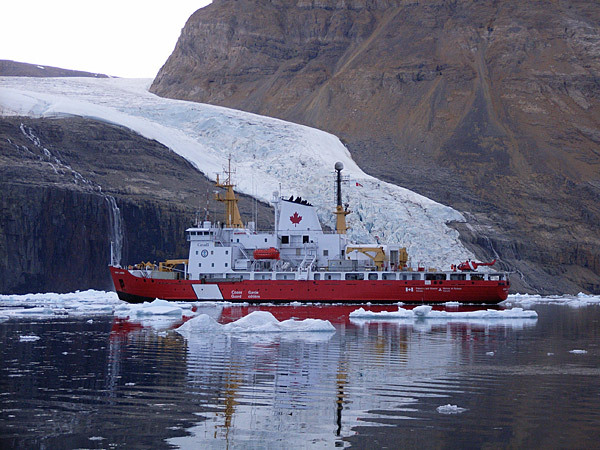 The Canadian Coast Guard Ship Henry Larsen is scheduled to travel to Nares Strait and Petermann Fjord later this summer to recover moorings placed by UD in 2009. These mooring data, if recovered, will provide scientists with ocean current, temperature, salinity and ice thickness data at better than hourly intervals from 2009 through 2012. 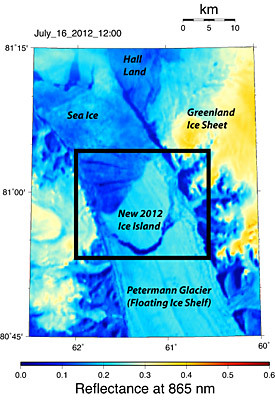 The period includes the passage of the 2010 ice island directly over the instruments. According to Muenchow, this newest ice island will follow the path of the 2010 ice island, providing a slow-moving floating taxi for polar bears, seals and other marine life until it enters Nares Strait, the deep channel between northern Greenland and Canada, where it likely will get broken up. 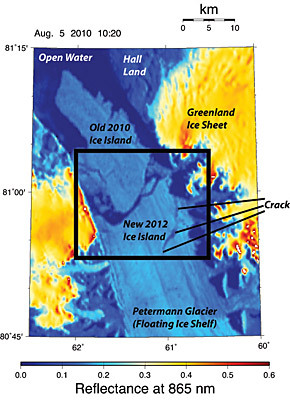 Prior to 2010, the last time such a sizable ice island was born in the region was 50 years ago. In 1962, the Ward Hunt Ice Shelf, on the northern coast of Ellesmere Island in Nunavut, Canada, calved a 230-square-mile island.